just a quick one. 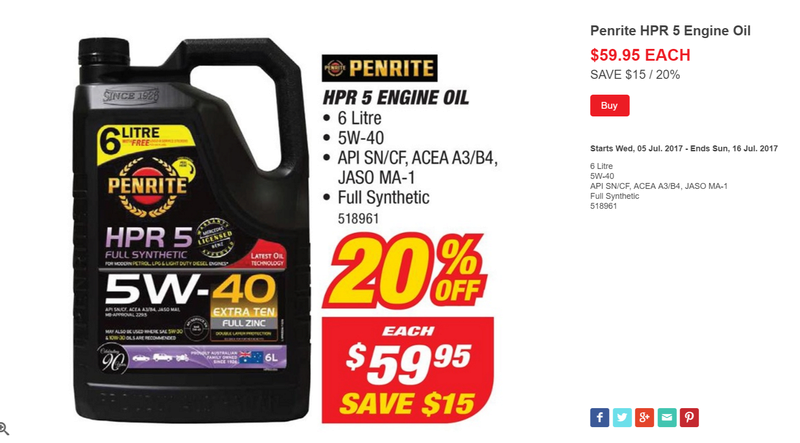 on the penrite website they mention hpr30 is ok for use in motorcycle engines with wet clutches but nothing is on the bottle at all with regards to that. I spoke to their lubes guys and they said it is ok to use but its not jaso ma certified because of the amount of zinc in the oil apparently as I recall. I could be wrong. anyways I thought that a heavy 60 weight oil might help my 1200 witha bit of a hot engine noise and clutch shudder just before the lever is fully released. I changed the filter and filled with hpr30. well im impressed. its smoother, clutch shudder is gone and quieter. I was using hpr gas 10. so the hpr30 gets my approval. It even has a little picture of a bike on the bottle! I use it in my dl1000 and my b1200 road bike. Hpr30 in my track bike. Until something comes along to change my way of thinking or finding out its been old recycled makkie d's chippy fat the whole time ill keep on using it. Btw i saw you can buy 4lt of motul 5100 10w50 for $70. Or you can buy 5lt of gas10 for $33.74 on special. Keep on using the gas10 enough times you will have enough left over in each bottle to get another change for free! Woooo hoooooo!!! I like it, bike does too. But i do get indigestion from it sometimes. Ill try that. Good news is i dont have to grunt now each time i haul myself out of a chair. Used 20w-50 (not Penrite tho) in the Bandit and GSX650F year round when we had them. Some of the colder temps got down to Oh or slightly lower. Used the same stuff (the 20w-50) in a 3.0 4cyl Deso engine for 170k-ish kms right down to -13 or so at times. No probs in that one either. @dhula wrote: Used 20w-50 (not Penrite tho) in the Bandit and GSX650F year round when we had them. Good to hear from you dhula how have you been ? @paul wrote: I might be missing something here, but why not just use motorcycle oil designed for motorcycles .................a little dearer sometimes depending on the oil , but the cost spread over mileage ratio would be negligible. Friction modifiers haven't been in engine oils for years. that was an 80's thing. Are you sure about that? Or is it just that they aren't advertised on the packaging as a "sales gimmick" now? Shell's web site still has this in it's FAQ's "Friction modifiers reduce the drag between moving parts to increase fuel economy." Mobil has "Proprietary Multi-Layer Anti-Wear Technology"
@paul wrote: Good to hear from you dhula how have you been ? Not riding anymore unfortunatly :-( but it's a personal choice driven by medical/physical issues. Doing more 4wding and camping type stuff now-a-days which suits us a bit better given what we can/can't or shouldn't be doing. I remember friction modified oil was blamed years ago for glazed bores causing oil burning issues. 6lts is pretty good value. The first number (5W) relates to its viscosity @ 0C and tells you about its start-up performance; a low number means it will flow well on initial start-up ensuring that you get oil where needed ASAP. This is generally the top end as it if furtherest away from the oil pump. The other number (40) relates to its viscosity @ 100C; as they are both 40 they will perform the same at the operating temp of the engine. So, 5W-40 as opposed to 10W-40; a little better cold and same (or more importantly as the engine manufacturer intended) at running temp. This IMO is a very good oil (lots of zinc, bad for cats good for engine wear), MA rated (so you know it will work in a motorcycle), widely available (that's one thing Supercheap has going for it) and well priced. I change this stuff annually. In the end, I think we enthusiasts are all intelligent people and so long as you aren't pouring chippy fat into your bike you aren't going to kill it. Motorcycle Oil is like ice cream - we all have our favorite flavor. I just need to have the Lactose free one - otherwise I spin a main bearing. I'm trying this as we speak. The only reason I've got it in my engine is, cause it was given to me. It has quietened it a little, but at the same time i put it in, i also went to a 50w oil, so that could also be a contributor to the silencing. It's thicker than syrup.Don't think I'll put it in again. In am thinking about the product "Cerma". Been reading a bit up on it, after recently working with an old fitter last week, that puts it in everything he's ever owned. But i do get scared of putting additives in engines.......as I've just done. I run the Lucas / Flashlube upper cylinder lube in my fuel each fill. The theory of it in my opinion is sound (lubes anything the fuel comes into contact with since lead has been outlawed) and it does leave the exhaust outlet that tiny iddy bit oily. My dyno lad gave me a bottle to mix with my oil, for Cam and Rocker treatment, not for valve seat control via fuel. I'm most concerned with the inner working of the head, and the heat also related to this area. Cerma, is supposed to penetrate all metal surfaces, and not mix with oil to give a ceramic like coating. It is a once only treatment, and from what i understand, you have to run the engine non stop for 6 hours, for it to work effectively. But......do i believe it ???? ?